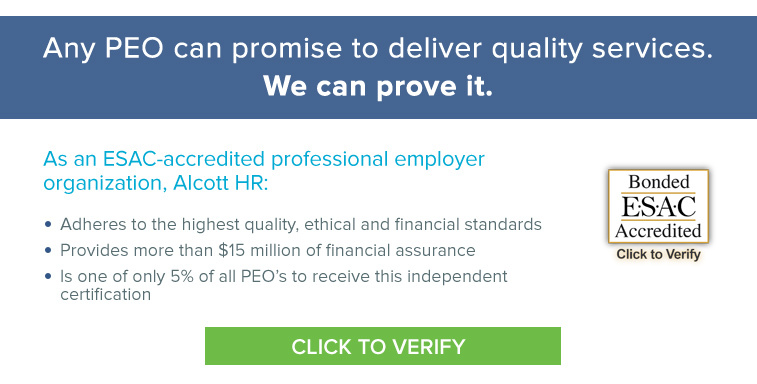 Alcott HR – Human Resource Management And PEO – Comprehensive HR outsourcing and PEO solutions. Turn your HR challenges into a competitive advantage with our all-inclusive PEO solution. Regulatory Compliance & Risk Management Leverage our expertise to reduce the risks of lawsuits, fines and audits associated with healthcare reform, wage and hour laws, HIPAA, and other federal, state and local regulations. Payroll and Payroll Taxes Our certified specialists and robust HR technology simplify the complex task of running payroll, including paying taxes, calculating deductions, generating reports and more. HR Administration Free up your time and enhance your focus while we help develop new HR policies, optimize your onboarding, improve your issue resolution approach and more. Employee Benefits Program Gain access to comprehensive employee benefits at competitive rates to level the playing field with big businesses and improve employee recruitment, retention and morale. Training and Development Make your employees more productive, knowledgeable and loyal with free professional development opportunities tailored to their career goals and your business needs. HR Technology Utilize the power of the latest and greatest HR technology without utilizing more of your budget – we manage and maintain our own systems so you don’t have to. Experience The Benefits Of HR Outsourcing. more efficient, secure, flexible and profitable. Since 1987, we have helped hundreds of small and medium-sized businesses grow by providing a comprehensive, flexible HR outsourcing program which controls costs, enhances regulatory compliance, reduces risks, improves employee recruitment and retention. If you are searching for an HR partner, we invite you to learn more about us and see how we can help you grow, too. Alcott HR makes it easier for me to be in business. Alcott HR gave our startup the assurance of beginning with a strong foundation. The benefits of having a partner like Alcott HR... has helped our team to focus on our practice and patients. I have to say: the customer service at Alcott has been exceptional. Everyone is pleasant, responsive and solution seekers. It's so helpful to be working with a great team of professionals.